According to HPI Valuations, there are more convertibles per head in the UK than any other European country, despite being one of the wettest countries in the continent. British wishful thinking? The true reason lies with a change in company fleet policies some 8-10 years ago, which meant the hard roof and four door rule fell by the wayside. However reveals, HPI, an oversupply of convertibles, combined with an economic downturn has meant that used values in this sector have fallen, leaving some summertime bargains to be had. Martin Keighley, HPI's valuations expert explains: "A relaxation in fleet policies has seen company car drivers motoring around in the Audi TT, whilst the likes Micra CC and Tigra provided open top freedom at a price many businesses could afford. But demand in recent times has dwindled and subsequently so has the residual value of these used cars. This is good news for those private car buyers looking to take advantage of market conditions and nab themselves a cabriolet." However, warns Keighley, "If you are in the market to buy a new convertible, go for one that is most likely to hold its value to ensure you get the best bang for your buck." HPI's top ten league table of convertible cars that have held their residual value, puts the Audi TT Roadster and the Audi A3 Convertible in the top two spots. The MINI convertible is a new entry at number 3. Continues Keighley: "If it's cheap wind in the hair motoring then the Copen, Micra CC and new Fiat 500C are all good value. But without a doubt the best all-rounder remains the MINI convertible." The average 3 year 60,000 miles residual forecast for all cars is 31.2% of its original price at new, but for the convertible car the average is 37.3%, with all of the top ten convertibles well above average on both counts. Keighley concludes, "A convertible represents the perfect balance of image and fun, whilst still holding value. 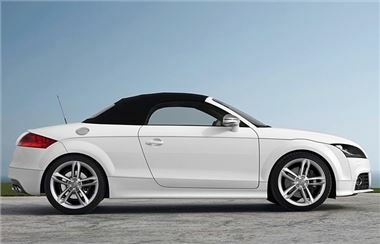 People are obviously still remaining frugal during the difficult financial climate, however as models are becoming more affordable, convertibles are quickly becoming the best all-rounder for style and value". VIPDATA (www.vipdata.co.uk) in 2007, providing values for over 30,000 vehicles.